After a successful five-year anniversary celebration this week, Restaurant Michael has graciously extended the anniversary celebration through today, Friday, October 8. The special includes Whole Roasted Maine Lobster poached in butter and served over silky smooth polenta, lightly scented with tarragon. The dish will be at a special anniversary price of $27 per person, as a thank you to the support and friendship over the last five years. Reservations are strongtly recommended. Be sure to indicate you'd like a lobster when making your reservation. Joining the Friday evening special is live jazz music featuring female vocalist Petra Van Nuis. Petra will be performing every Friday evening now through the first of the year. Restaurant Michael is located at 64 Green Bay Rd. 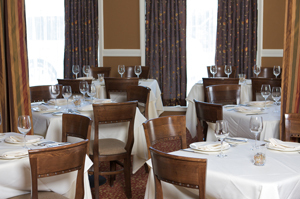 in Winnetka, Ill. Reservations can be made at (847) 441-3100 or via www.restaurantmichael.com. Be sure to "Like" Restaurant Michael on Facebook for more inside information and commentary from Chef/Owner Michael Lachowicz. Follow Michael on Twitter at @RestoMichael.